On behalf of the Yorba Linda Middle School staff and faculty, welcome to the 2018-19 school year. 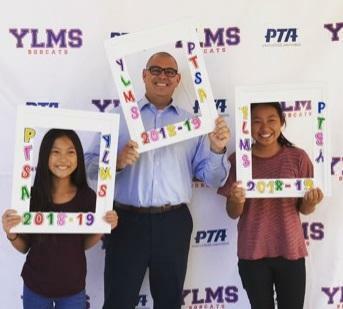 It is an honor to introduce myself as the Principal of Yorba Linda Middle School (YLMS) and join an extraordinary school community. Over the past few days, I have been spending a lot of time at YLMS getting to know the building, school community, and excellent staff. A common theme I continue to hear is that YLMS has fantastic parent and community support and involvement. I have learned that YLMS is a place where strong connections are made between home and school and that it is a school where all staff members are committed to helping your child Succeed Every Day! I value both of these characteristics and am excited to help continue moving YLMS along the path of excellence. I am looking forward to a successful year filled with many learning opportunities to enrich your student's life. I have been in education for 24 years, all of which have been in PYLUSD. I started my career at Esperanza High School as a science teacher, physical education teacher, and coach. I spent 19 years as a classroom teacher working with students of various abilities. I also had the opportunity to serve as the head football coach at Esperanza for four years. I chose to step away from coaching to pursue my administrative credential. I had the opportunity to transition to administration almost five years ago as the Assistant Principal at Esperanza High School. That experience propelled me to my recent position at Yorba Linda High School where I have been the Assistant Principal for the past four years. I live in Yorba Linda with my wife of 21 years, Chi, and our two children Taylor (17) and Logan (14). My daughter will be a Junior at Esperanza High School, and my son is entering eighth grade at Travis Ranch Middle School. When I am not at school, I enjoy watching my children's sports, volunteering in the community, boating and camping with my family, and mountain biking. For me, the first day of school can’t get here fast enough as I am very eager to meet all of you and your wonderful children. I believe one of the most important aspects of my work as the Principal of YLMS is building meaningful relationships with students, families, and teachers. I have found that students appreciate a person who genuinely invests in them by listening, learning alongside them, and being fair and consistent. It will be essential for me to be in the hallways, classrooms, and in the lunch area getting to know your children throughout the year. In addition to building strong relationships with students, families, and teachers, it is particularly crucial for me to make sure that you and your child feel safe and respected at our school. If you ever have a concern, please do not hesitate to call the office or email me directly at gkemp@pylusd.org. I believe open communication is essential and for this reason, I will always encourage you to reach out to your child’s teacher, a member of the office staff, or me with any questions you may have. I am excited to be part of the Yorba Linda Middle School family and look forward to a great year.